Would you be mad at me for posting this short and sweet like the recipe? I made these for the family over the weekend after a nice grilled dinner. I got the idea while flipping through Steamy Kitchen’s cookbook…was surprised to find them in there! What surprised me even more is that I didn’t think of them myself! These guys were so awesome…and such a great way to end a meal…practically guilt free. Start of by laying your banana on its side, using a pairing knife gently slice through skin and banana making sure to not cut through to the other side. Once you’ve made your slice, tuck in your fixings. You can stuff them with whatever suits you…chocolate candy bars, chocolate chips, butterscotch chips, caramels, coconut, chopped nuts. The sound of it all is heavenly isn’t it? Place them on hot grill over indirect heat and cook until soft and skins are black. You have to check on them and touch them a bit. We used what we had on hand…chocolate chips, coconut and toasted and chopped hazelnuts. My kids were not as excited as Larry and I were…apparently the “melted” version of chocolate chips were not the same as the solid form. And for my daughter who for some odd reason does not like chocolate, I took a chance and tried butterscotch chips on hers. Nah. So, Larry and I enjoyed ours and theirs….and we were absolutely okay with that. What a cool idea Aggie! A great dessert for all the upcoming grilling times. What a neat presentation too! Gorgeous!! Love this idea Aggie, looks so good! I would have NEVER thought to make this – how clever!! Looks SO fancy – love it! I love this recipe! What a great after school or weekend snack. The filling possibilities are endless. Yep..I have done a the same thing but with different ingredients…The hubby and I love them but the kids wouldn’t even touch them!!! weirdos! Love this idea! 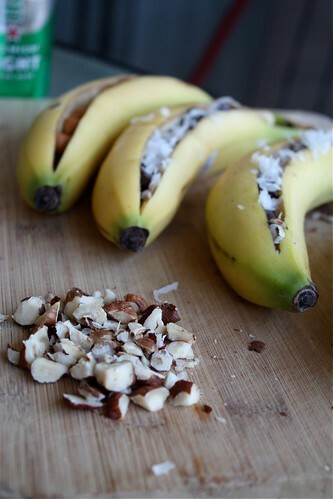 Something different for a dessert… and with bananas they at least seem healthier! You’ve got me seriously drooling over this one! Sometimes the simplest recipes are the best recipes. I love caramelized bananas. I have yet to make them on the grill though, I can only imagine the flavor they get. The butterscotch chips sound like a winner to me! what a great, easy treat! Oooh yum! Trying this week! Oh yum, I’ve got to make these for Balcony Girls! YUM! WOW!!! Looks delish – can’t wait to try!! Wow – looks fantastic. I love the versatility too! This is so unique, I’ve never heard of it before? How are you Aggie? We make these all the time when camping. We usually put in marshmallows and chocolate chips. YUM! We wrap them in foil and place them over the campfire. Mind sending me one to help cure pms? This has to be a perfect cure. Chocolate chips, coconut, banana…how can you go wrong? Your photos are stellar, Aggie! I have really fond memories of making these when I was a Girl Scout! They are SO gooey and delicious. We would always wrap them in tin foil and stick them on the fire – yum! this is such a fun dessert! my family would love this! This is fantastic! A great idea! Looks scrumptious! I would have never thought of this, but sure am glad somebody did. A definite try for the grilling season! Cool idea! I once steamed pork and rice in banana peels before, but I’ve never thought of grilling them. Great use of something most people throw away. I too have had trouble getting my kids to enjoy baked bananas and it makes no sense to me. These look divine! Thanks. I love this idea. I’m all over it, I know what our dessert will be tonight! I really like the sound of doing bananas like this! 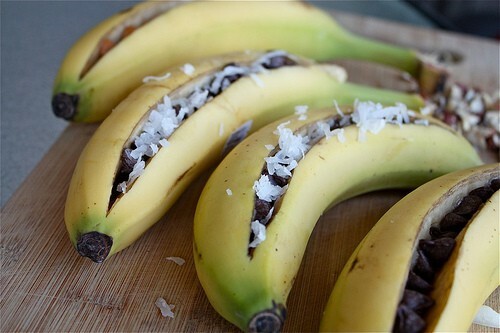 I don’t even like bananas and I want to make these for my whole family this summer at the shore. Looks delicious thanks for sharing! What a fun idea for a light dessert. We’ll have to try it out this summer! Takes me back to 4H camp. Would be nice to enjoy one again without having to swim in a leech-infested lake to earn it . . . I love this recipe. We tried it for the first time when we had our family get together in San Marcos, Texas. These were great for everyone to sit out by the pool and eat! Delicious. Yum! 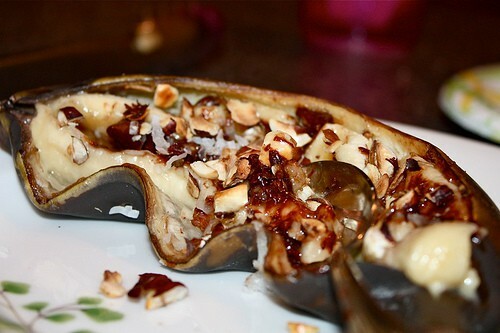 I made these for company yesterday with chocolate chips, butterscotch chips, flaked coconut, and a mixture of chopped almonds, walnuts, and pecans. Rave reviews all around 🙂 and so easy, too! Yum these look incredible! I would definitely dig into these. Pingback: 50 sites para conhecer antes do mundo acabar – 1# Endlesssimmer 100 way to cook « Boldness – The Open Blog! Its also possible to make these in the microwave! They taste heavenly. Awesome. So glad you told me that! Am going to try, thanks!